Somewhere along the line Maureen transitioned from the savory side to the sweet side of life, and today finds Maureen baking up a storm for family celebrations, high school events for her son John, her local neighborhood, and just for the heck of it — because it makes her happy — as it does those on the receiving end of her endeavors! Seldom a week goes by that Maureen isn’t posting one of her latest creations on FaceBook. Some of them are so clever, like the christening “dress” made out of cupcakes. I wanted to dig a little deeper and see where and or how she is getting her inspiration. 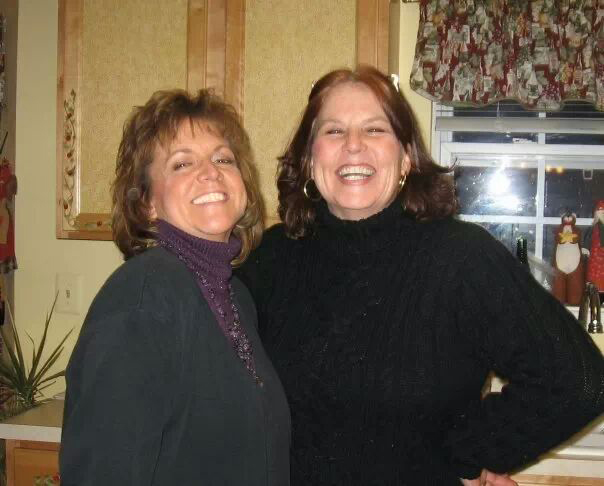 Lynn Holl and Maureen Evans Kelly in her kitchen in Oxford, NJ several years ago. LH – What sources do you go to for inspiration? MK – I never was a baker, then a couple of years ago I decided that I wanted to do something fun, spare time was becoming available since my kids are grown and I would be able to practice without interruption. Right now this is all for fun. Seeing some of the reactions from family and friends made me want to persue cake decorating and baking even more. So I have a couple of blogs I have been going to: Pinterest, Mycakeschool, and the Country Cook which I frequent the most. Also, I refer back to my cook books. Whenever I am out and about I ask a lot of questions of people to see what kind of cakes/cookies they like/dislike. If anyone has a favorite recipe they like, I then make my own adjustments by adding my own flare to it. I am constantly looking for items I could use to decorate or display my baked goods. LH – Approximately how many hours per week do you spend baking? LH – What do you consider to be your best creation? MK – I really like the christening dress I made for my niece Keri. That was the easiest! This cake dress can be adapted to a bridal show, wedding, girls birthday party, and so on. Use different colors to match the theme, add a candy brooch, flowers, anything that will make it your own. LH – Did you ever bake a complete flop, and if so what was it and why did it turn out bad? MK – No not really, there were times I added a little more/less than the recipe called for but it turned out fine. By the way, when I called you over the Holidays about your sugar cookie recipe and added 3 Tbsp. instead of 1 tsp. of vanilla, I panicked but then the cookies came out just fine. At this time I was baking 4-5 different cookies and had a lot going on. Now I always measure out my ingredients first, as opposed to adding each ingredient then putting it away, to make room on my counter. LH – Do you have any aspirations of taking your passion to another level and start selling commercially? MK – Yes, I would love to take this to the next level. Cake decorating is ever-evolving with a constant array of new techniques and ideas. The options are unlimited, and in the future I’ve thought about teaching online and adult classes. Cake decorating is a truly fun and personal way to express my creativity. LH – Does your husband Marty share in your baking enthusiasm? MK – Yes, Marty loves all the outcomes, he’s my best critic. He doesn’t like store brought cakes anymore! My children also like certain cakes. Courtney loves my Chocolate Ganache with Oreo Cream Cheese Filling, Angela loves the Almond Sour Cream Cake with either strawberry or pineapple cream fillings. John loves fondant, so he eats it plain, he only eats cake without icing and no chocolate! LH – Have you taken baking classes, and if so where? MK – Yes I have taken the Wilton Cake Decorating Classes 1 through 3, and still have to take the 4th installment at our local Michael’s Craft Store. I joined Mycakeschool.com also and have learned a lot from watching videos and blogs. LH – While I don’t really eat much dessert, one of my retirement goals is to learn how to create those beautiful cakes using colored fondant. Have you had much success using fondant? MK – While fondant looks great on cakes, I am not a fan of the taste. You need a denser cake to be able to hold up the weight of the fondant if you are going to layer/tier the cake. When you work with fondant, depending on your filling, the cake can be made up a couple of days before your party. The fondant preserves the cake and filling. I do practice making flowers, they can be stored for quite some time. My instructor at The Wilton classes told me that when Wilton wanted to know more about fondant and the British wanted to know more about buttercream, they got together to teach each other about the icings. When asked by Wilton if they disregard the fondant when slicing the cake, they replied absolutely not, they love the taste of fondant! Wilton was a little taken aback. LH – Do you feel your kitchen is conducive to your baking needs; and is there anything you would like to change about your kitchen? MK – Although my kitchen is a good size, there really is no large counter space. In the future, I want to put in an island of some sort to give me the room I need to prepare my cakes/cookies/pies. I make do now by keeping everything off the counters. Thanks cousin for spending a little time with me and the food blog followers. It’s been so exciting to see your baking progression over the years. CLICK to enlarge – At left is a photo of us as bridesmaids at Jeanne Jeffrey’s wedding in July 1980, with another cousin, Chrissi Sullivan between us. And at right, celebrating at the Longhorn Saloon in South Orange, NJ. 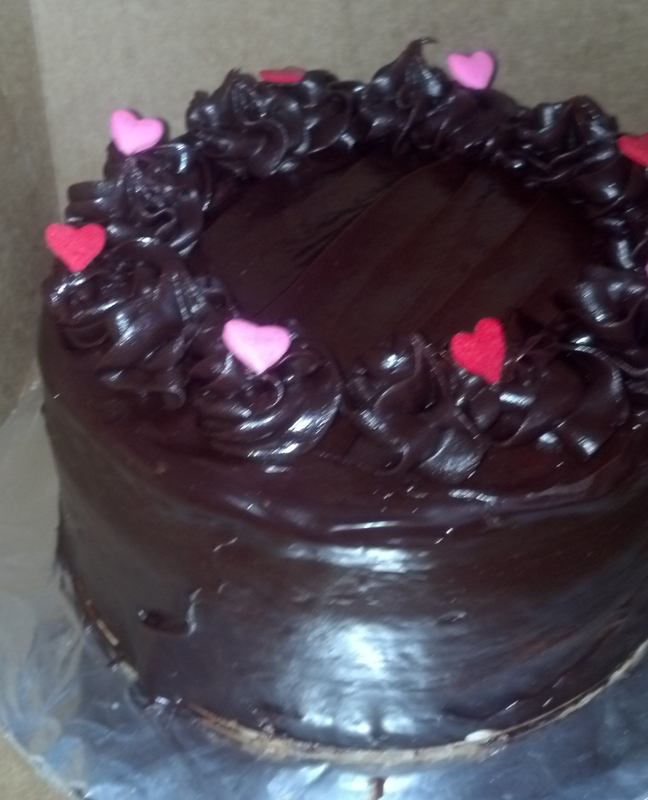 A delicious chocolate ganache cake with heart decorations. 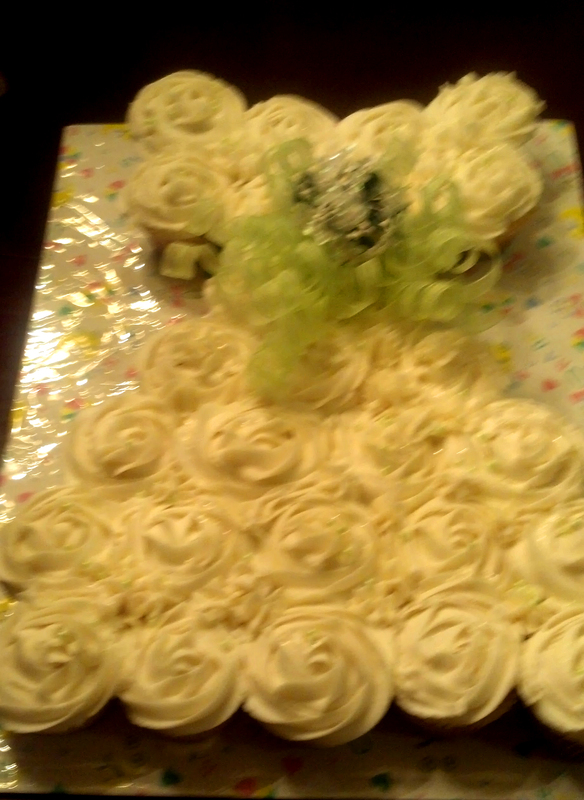 The wonderful “christening dress” made from cupcakes. 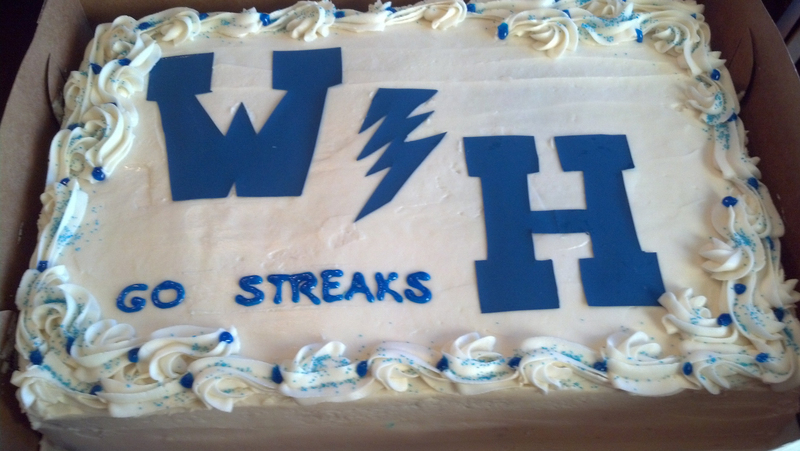 A sheet cake for her son’s high school football team.